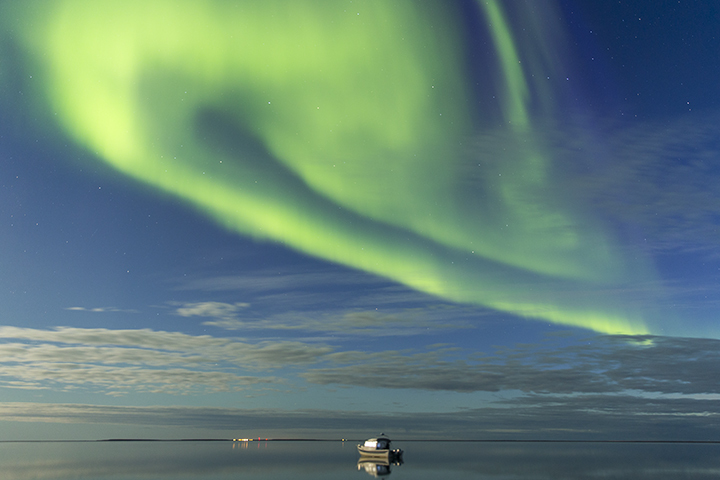 Watching the northern lights dance like green curtains on the wind above Sentry Island, I stay up past midnight before clouds began to cover the sky and extinguish the lights. In the morning, the sea is flat and calm like glass, and I decide it’s time to go. From here it’s ten miles to Arviat, the final village before I’ll pass south of the 60th parallel on my way out of Nunavut Territory and into Manitoba. From there it’s 85 miles to an abandoned trading post at Egg Island, and then another 75 miles to my destination in Churchill. In between…not much. Lots of flat, marshy coastline with boulder-strewn tidal flats reaching up to five miles offshore. Great for migrating birds, but for me? No shelter, no anchorage, no place to hide. Just Hudson Bay stretching 500 miles to the east, all the way to Ontario. I feel that exposure like a heavy weight. If the winds turn easterly, I’m in for it. It did, and I was. I’ve become a bit like an old plow horse that’s suddenly gotten a whiff of the paddock. I’m ready to be done. I forego whatever charms Arviat has on offer and motor south. At six knots I’m in for a long day, but my hope is that I’ll have the extra light of the full moon to guide me into the small cove at my destination. Throughout the day, I made steady progress but watch with uncertainty as clouds build and the first whispers of a breeze came up from the east. 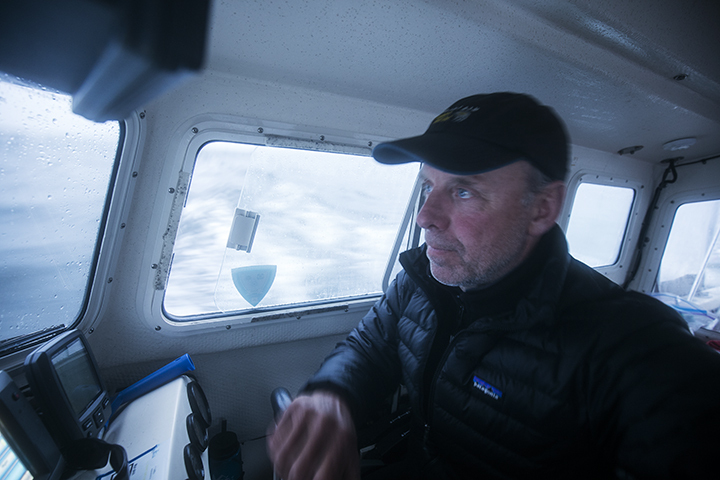 By nightfall, it was bucketing down rain and blowing 20 knots from the northeast, and no amount of wishful thinking or fancy navigation was going to put me into that anchorage, not in four-foot breaking seas under pitch black clouds. Lumpy seas in daylight are a discomfort. But in the darkness, when you can’t see what’s coming, it’s like getting beaten up with a sack over your head. You never know when or from where the next blow is coming. This late in the season, true night has returned even to these northern latitudes. I resolved to avoid the temptation of stumbling blindly into an unknown, unmarked anchorage and risk finding myself on the rocks. Though that would have made for better reading. Instead, I had to take my medicine. Motoring offshore, I beat into the waves to get some distance from the shallows, and waited out the night. I even managed to shut my eyes in a sort of half-sleep for an hour before the wind carried me back toward the rocks. Around five the western sky cleared for a moment, revealing the setting full moon, but the seas remained angry. I took one look at the breakers at the narrow cove entrance and turned the boat to continue south. I hoped to stop at Hubbart Point halfway there, but at low tide I found no shelter from the seas, just rising wind and a bad feeling that the door was swinging closed. I never would have gone out in 25 knots if I had a choice in the matter, but the hard facts of my situation told me go now or spend another night out on the water. So I went, motoring a straight line course southeast toward Churchill. The Bay gave me passage, but only just. I rode over 12-foot breaking swells that dumped huge showers of water onto the boat. With both bilge pumps shot and only one engine running (badly), I felt like I was hanging by a thread that was fraying before my eyes. Suddenly, I was surrounded. Out my window I could just make out their shapes in the darkness, a dozen or more. The welcoming committee. It was a pod of beluga whales from the Churchill River, surrounding the boat as if in greeting. Through the hull I could hear their underwater whistling song. This entry was posted on Saturday, September 5th, 2015 at 12:26 pm. It is filed under On the Road. You can follow any responses to this entry through the RSS 2.0 feed.